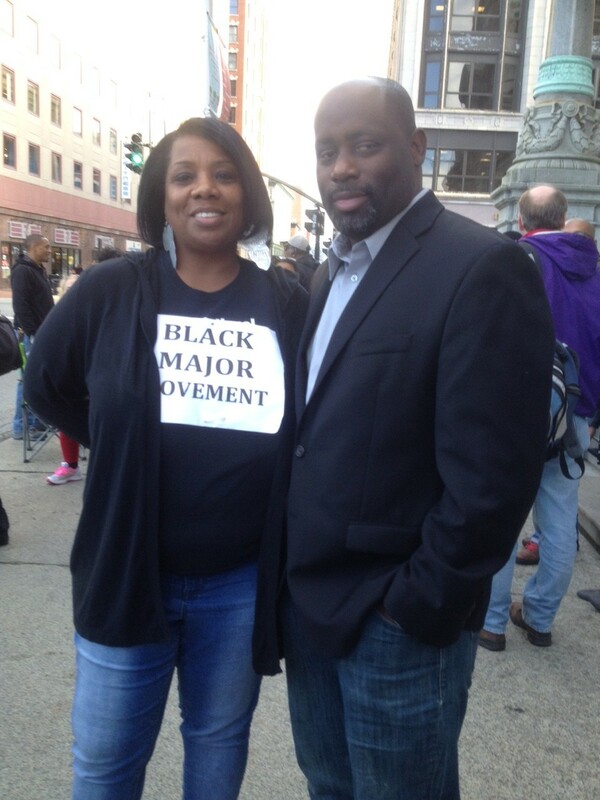 Today in my city of Providence, Rhode Island I attended a rally for the Black Major Movement on the steps of City Hall. 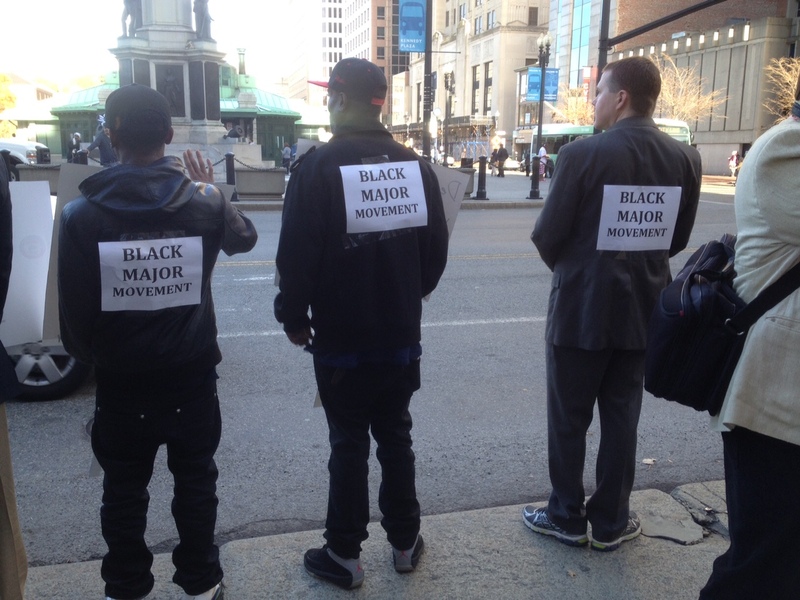 The Black Major Movement is working to make change in law enforcement, the judicial system, the school department and community organizations by calling for an increase in black leadership throughout the city of Providence, and in particular there is a call for the city to hire a black Major in the Providence Police Department, since there are no black officers higher than rank of Sargeant, and it has been this way for quite some time. 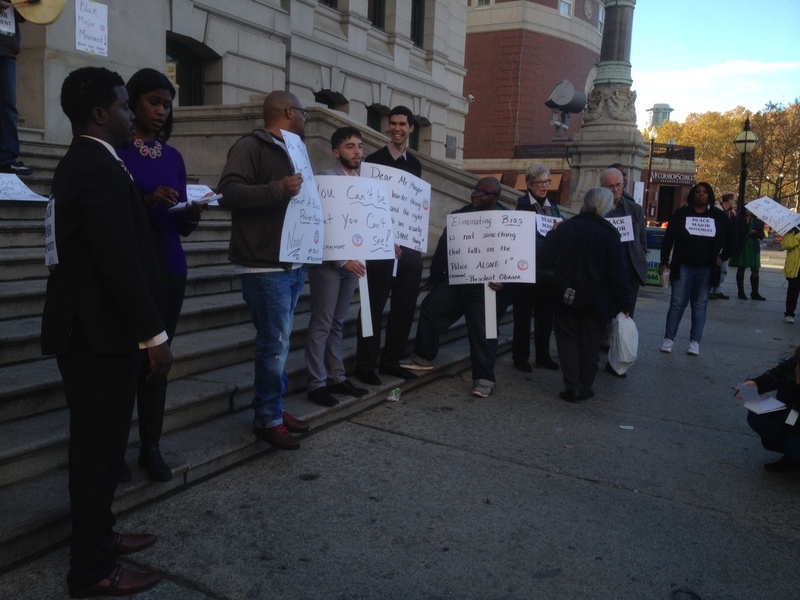 The movement is being led by among others, community organizer, Kobi Dennis, founder of the Night Vision program, and the Providence Midnight Summer Basketball League, and Jim Vincent, President of the local NAACP. The rally was a peaceful one, with people holding signs calling for attention to the lack of representation of people of color in leadership roles throughout the city, as well as wearing signs on their backs that read, “Black Major Movement.” As noted in the Talk Back following Trinity Repertory Company’s “Every 28 Hours” I wrote about last week, the call for equality, and the statement that Black Lives Matter is not calling for violence against police–in fact the flyers announcing today’s rally circulated support that, clearly stating at the bottom, “Please Come In Peace As We Are Pro-Police.” The rally is instead a call for awareness, a call to validate the rights and concerns of people of color, and a call to validate the deservedness that black people should have people that look like them represented in community leadership. 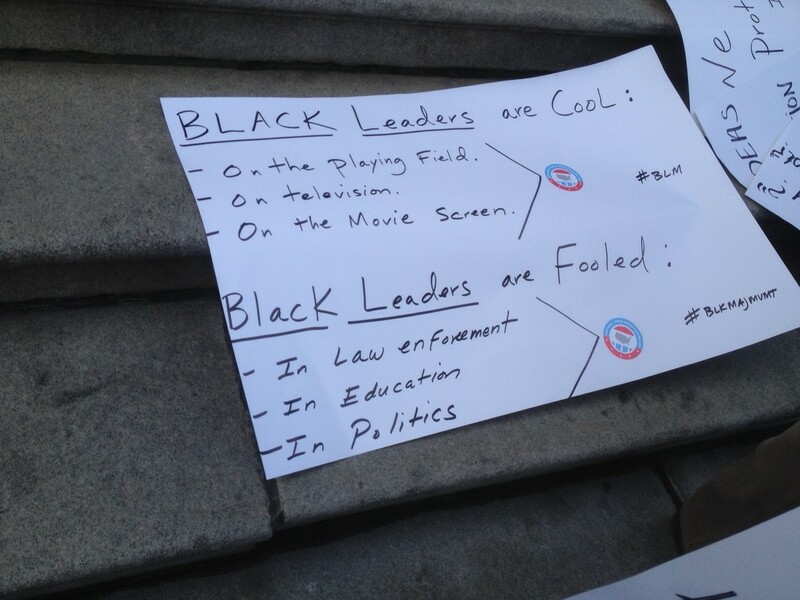 Here are some photos from today’s rally. I’m hoping that change will come soon, and wish to keep doing what I can to support this important work. Awesome writeup Wendy. Thanks for all you do in the Providence communities. Having someone that understands our purpose helps the movement’s narrative to stay positive driven. Thanks so much for your kind words, Helen. I try, and always feel like I can do more. Thank you for all that you do, and have been doing for quite some time now. I’m just glad that I’m finally connecting to what’s going on here in Providence, after moving here eight years ago. Thanks again! Hello, there, my so, so very For Always dearly special and dearly precious Jewish and white sisterfriend who you are For Always so, so very much, Wendy Jane!!!!! Yay, sister, yay!!!!!! I’m finally able to respond to your absolutely beautiful and so very lovingly caring, sensitively heartfelt, and so full of inspiration blog post article with my very heartfelt and thorough comment, sister!!!!!! I became a little sick from that darn bee sting yesterday-not an allergic reaction but sometimes I get a little sick from bee stings even though it is not an allergic reaction exactly, Wendy Jane. That darned bee(SMILE!!!!!!!!-UGH!!!!!!!). Sister, I so, so very much love, like, and cherish you and how you are just so very dedicated with such conscientious diligence to loving us as black persons and being very concerned about our needs and concerns wanting for our best interests to be met, sisterfriend! I love how you reach out to us as black persons and how you so love and cherish black culture in all of its great and beautiful variety, Wendy Jane! I am so overjoyed and thrilled that you went to this very vitally important, urgent, and necessary rally and that you were a very eagerly earnest participant. I love the great and cool pictures of the wonderful people and activists which you included with this spectacular blog post article of yours, my friend! It is very much indeed important, urgent, and so very vitally necessary that Providence has more representation of black persons in leadership like in having a black major in the police department and in general, sister. I think this need is also a need in other cities around our country as well. I am so very pleased with all of the great work by the people aiming to get more black leadership in all areas in your wonderful Providence, Rhode Island, and I am so excited to see them enacting their agency and empowerment in seeking and attaining these goals. What great work they all are doing here, sister! I am just so, so very thrilled and happy that this turned out to be a peaceful rally as well, sister!!!!!! Wendy Jane, you have just made my day even better and brighter as I get started with my early morn from your very inspirational and magnificently beautiful blog post article so full of such Spirit-filled soul, sister!!!!!! I thank-you, thank-you, thank-you so, so very much and so so very profusely for this so very cool blog post article and for all you do in loving us as black persons and in reaching out to us across the racial divide, my so very precious and sweet white sisterfriend you are For Always so, so very much, Wendy Jane!!!!!! Please have a wondrously wonderful Wednesday and a relaxing rest of your week, and a wondrously wonderful weekend, my sister!!!!!! Wendy Jane, you are such a joy and a blessing, and my very joy and blessing, my so very dear friend!!!!!! Thank-you so For Always!!!!!! Thank you, Sherry! I hope you are feeling better after that bee sting! I agree, we need this representation of people of color in all areas of our community and business life. I too am so inspired by the work those are doing to fight the good fight and want to support in any way I can. We white people made this mess, so now we have to help see that it gets fixed!